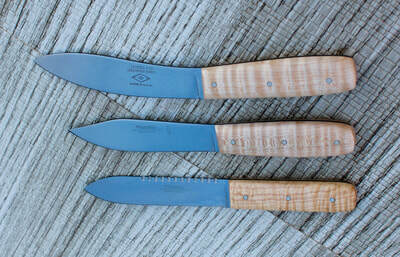 Below are models of the Russell Green River knives that I offer by order. I use maple for handles,and it has a simple boiled linseed oil finish. Practical & traditional. If you order two now,and more later,the maple will match. Also,you can easily maintain the boiled linseed oil sealer finish. My custom maple handle feels great in hand, very comfortable to use & good looking. 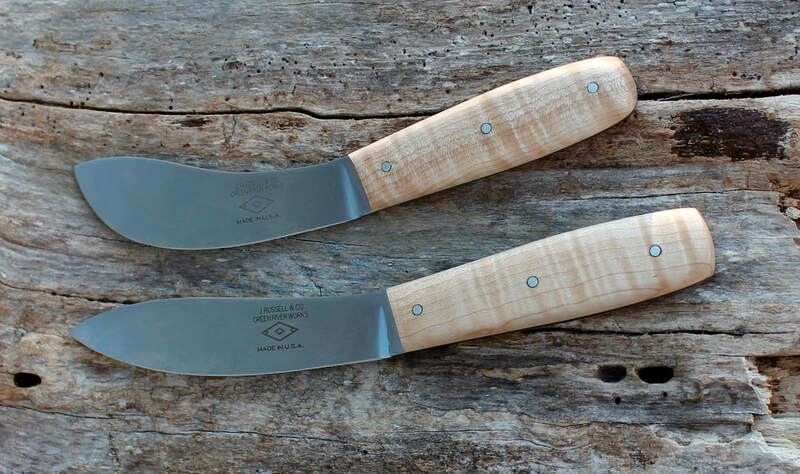 These blades are made in the U.S.A. by America's oldest cutlery company Dexter. 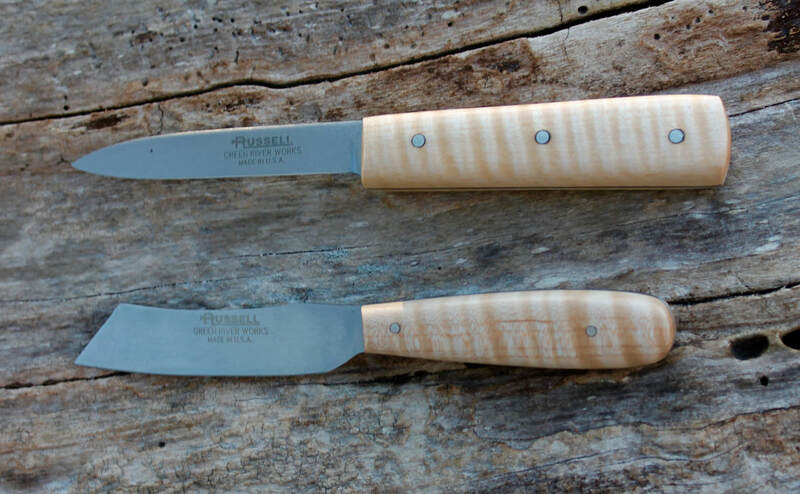 The Russell Green River blades are the same patterns they used in the 1800's . Factory forged 1095 carbon,flat ground thin. They take a keen edge easily and hold it very well. I will be adding three more models soon. 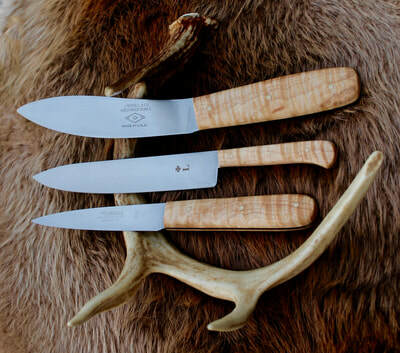 The Buffalo Skinner , the Patch Knife , and the Cartouche knife . Click the image to the right ( or below) ,it will enlarge. ​10" Butcher 15" OAL 9-3/4" cutting edge $85. 7" Butcher 11-1/2" , 6-3/4" $75. 6" Boning 10-1/2" , 6" $70. 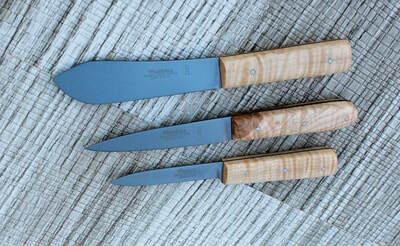 ​Sheep Skinner 5/32" thick , 9-3/4" OAL , 5-1/4" cutting edge $70. 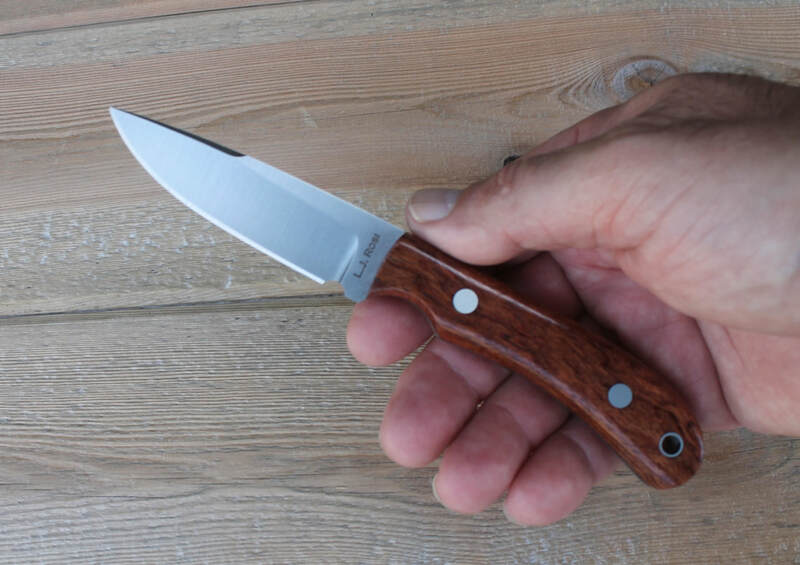 Clip Point Belt knife 3/32" ,9 , 4-3/4" $70. 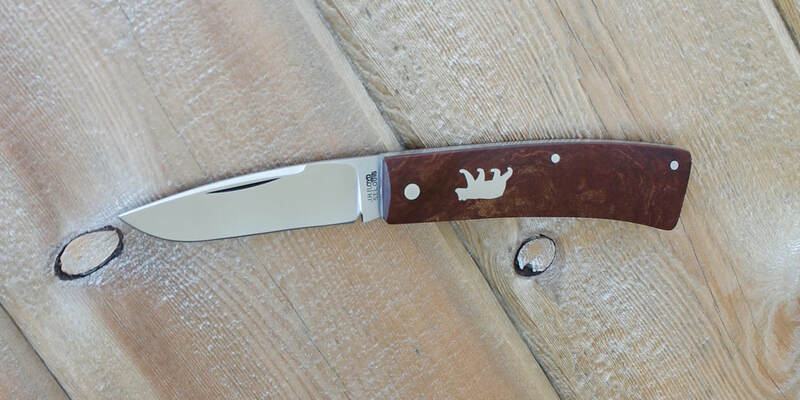 ​" Dadley " 3/32" , 8-7/8" , 4-7/8" $70.
" 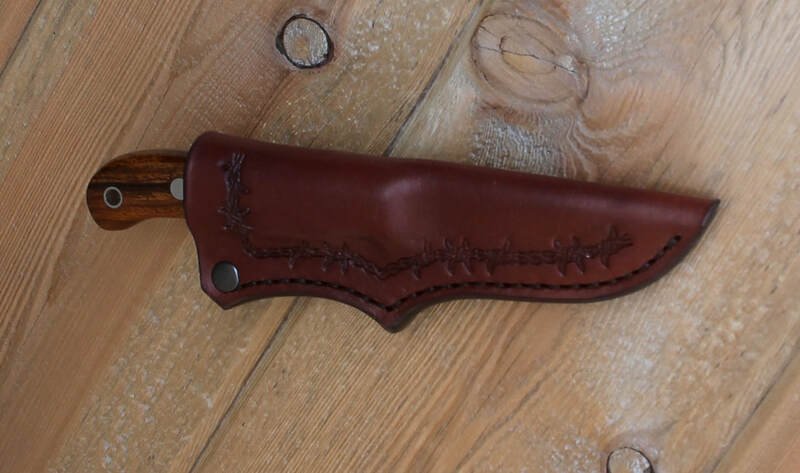 Sheath" knife 3/32" thick , 8-1/2" OAL , 4-1/2" cutting edge $65.
" 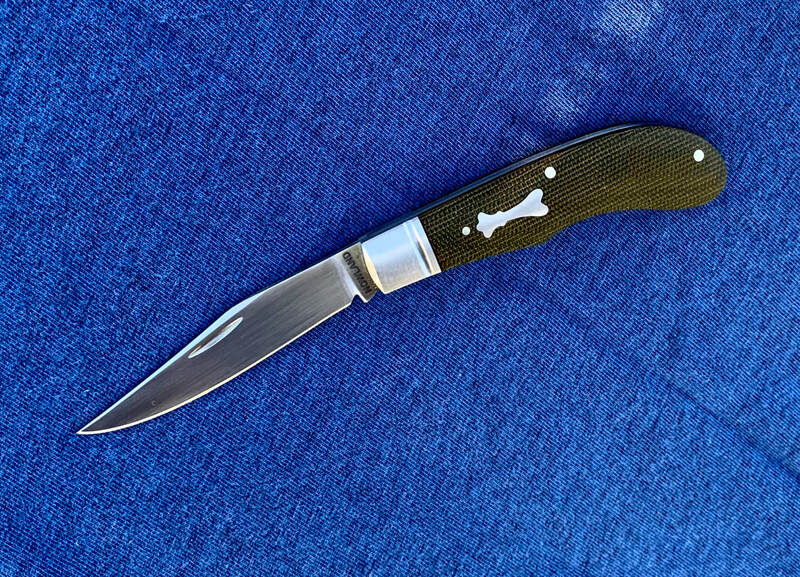 Ripper " 1/16" , 8-1/4" , 4" $65. ​Paring knife 1/16" , 7" , 3" $60.
" Patch" knife also referred to as a " Pacific Parer"
Thickness is about the same as the Ripper about 1/16"